Yes, it’s a week or two past Veterans Day. It’s wonderful to have a day of the year where our veterans get the attention they deserve. However, one company has a rich history of hiring former military personnel year round, and they have been doing so for over 70 years. Service Linen Supply, a hallmark of downtown Renton, was founded in 1946. The Second World War had just ended, and GIs were looking for work. Paul Jassny was looking for a new venture at the end of his service, and he and his brother-in-law purchased then-called Renton Laundry from another family. After a decade of growing the business together, Paul’s brother-in-law sold his share, and Frank Raphael bought in. Today their sons, David Jassny and Bob Raphael, spearhead the company. “We had many men returning from the front back then, and we put them to work.” David remembers one veteran in particular that was with the company for over 50 years. John Primon served as the Company’s Sales Department, driver, and did whatever else was needed of him for over half a century. He was the one who suggested that Service Linen try pursuing business just a bit north of them, in a little town called Seattle. 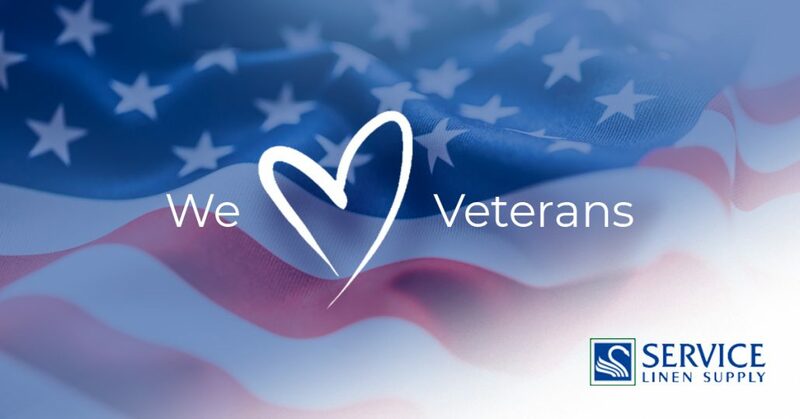 Along with their Human Resources team, David and Bob have continued the tradition of hiring veterans. Just like in the beginning, the Company has had great success transitioning Military Veterans into Route Managers. It’s not uncommon for veterans to retire with Service Linen Supply a second time after they retire from the service. Service Linen Supply also actively seeks former members of the Armed Forces, particularly Navy personnel, to work on their Engineering staff. Navy veterans often have the experience working with boilers necessary to keep the equipment running in the 53,000 square foot plant. Mike Kime, the Company’s Chief Engineer for the last 6 years, has been employed by the company since 2003. He spent 20 years in the Navy, and started working for Service Linen on his third day as a civilian. Veterans have been doing so well at keeping the boiler maintained that it hasn’t needed replacement since 1971. Service Linen has hired ­6 veterans in the last six months.